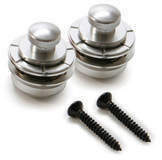 Xtra-Secure Guitar Strap Locks, Guitar Strap/Attachment from Hennessey Guitar Parts. The Xtra-Secure Guitar Strap Locks are the first entry to the new Hennessey Guitar Parts line. A thumb and two fingers are required to release the lock from the guitar button. The locking device is made up of (5) 3mm diameter ball-bearings inserted into a center hub. Positioned 72 degrees apart, these bearings apply even pressure on the custom locking button attached to the guitar. 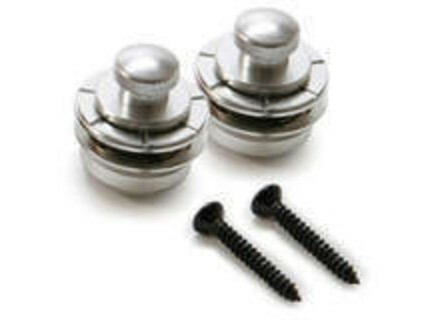 The button is attached with a 1" long, hardened-steel number 2 Philip-head wood screw. A felt washer cushions the contact point between the button and guitar finish. The heart of the lock is its spring-loaded retaining-ring. The ring is held firmly over the top of the ball bearings until it is pulled back. This releases the bearings and disengages the strap lock. The new NSL7300 Metallic series Guitar Strap Locks are made of aircraft-grade aluminum, according to Hennessey. They feature an anodized finish. The locks are available in anodized Black, Gun Metal, Purple, Silver, Blue and Red. Hennessey strap locks are also available in brass versions, designated as the NSL7200 series. They share the same design features as the NSL7300's, but the brass construction allows for Chrome, Gold, and Black plating, thus matching the hardware of most production instruments. All models within the NSL7200 series and the NSL7300 series are packaged and sold in pairs. List Price starts at $30.99 a pair for the brass strap locks and $33.99 for the Metallics. For more info, visit ww.hennesseyguitarparts.com. Eastwood Guitars Breadwinner Tribute Eastwood Guitars has debuted the new Breadwinner tribute guitar at NAMM 2009 last month. Gator TSA ATA Guitar Case The exterior of the case features "military grade" Polyethylene construction with black, stealth, powder coated valance and hardware, according to Gator. Ibanez Paul Gilbert Signature Fireman The PGMFRM1 Paul Gilbert "Fireman" is described as the doppelganger answer to the Ibanez Iceman.